This news roundup is a collection of headlines and other items on neglected tropical diseases, and does not reflect the work or the views of the Neglected Tropical Diseases Support Center. Search of potent antifilarial drugs has been a major thrust area in tropical medicine research over the decades. Herein, we report 4,7-dimethyl-3,4,7,8-tetrahydro-3λ6-[1,2]thiazino[4,3-f]quinoline-3,3,8-trione (8l) as a new class of antifilarial agent which is extremely potent, with lethality against all the developmental stages (oocyte, microfilaria and adult) of the filarial parasite Setaria cervi. . . Taken en masse, this maiden report on a novel quinolone fused cyclic sulfonamide presents a promising therapeutic lead for lymphatic filariasis in future. The goal of this work was to investigate the effect of gamma irradiated entomopathogenic nematode EPN; Steinernema scapterisci on third and fourth larval instars of Culex pipiens under laboratory conditions and its effect on the elemental composition of the treated larvae. Results showed that normal and irradiated tested nematodes differed in their efficacies against third and fourth larval instars. Stakeholders within the health sector have called for intensified efforts in the fight against river blindness especially by eliminating the factors that facilitate cross-border transmission. On August 7, the Ministry of Health together with the Carter Center convened a meeting of the Uganda Onchocerciasis Elimination Expert Advisory Committee (UOEEAC) to take stock of the progress made in reducing the prevalence of onchocerciasis (river blindness) and what needs to be done to eliminate it. Uganda is edging closer to eliminating onchocerciasis or river blindness, a disease that can lead to permanent blindness if left untreated, but more effort from South Sudan and the Democratic Republic of Congo will be crucial in preventing cross-border transmission. The long running conflicts in the two countries have made it difficult for the disease to be controlled over the years, according to Dr Edridah Muheki, chairperson of the Uganda Onchocerciasis Elimination Expert Advisory Committee. The WHO Onchocerciasis Technical Advisory Subgroup (OTS) was established in order to provide advice to WHO in accordance with the terms of reference developed for the subgroup. The objectives of the 1st meeting were to review current strategies and provide recommendations on potential common strategies or components of common strategies for onchocerciasis elimination mapping, for determining when a stop-MDA evaluation should be performed, for performing stop-MDA evaluations, and to identify key research and operational questions that need to be answered to develop the evidence-base to support strategies for the above mentioned programmatic activities. I think lessons of India really are making sure your primary health care system works, the people who are suffering from lymphatic filariasis, we often say it’s one of the neglected tropical diseases, it’s actually diseases of neglected people, often you find these disease most common in the people who are furthest away from healthcare and who can’t afford healthcare. I think one of the main lessons is to make sure your health system really working at the periphery I think that will be one of the major lessons I would take from the Africa. A medical journal published by the Centers for Disease Control and Prevention featured a striking cover image this month: a painting of a human eye covered with long, undulating worms. The work depicts parasitic nematodes, also known as Loa loa worms or African eye worms. The parasites are spread primarily by the bites of flies in Central and West Africa. People often don't realize they're infected until they spot a worm wriggling in their eye. But the story behind the painting is more personal than the image lets on. David Dunne, Moussa Sacko, Jürg Utzinger, Birgitte Vennervald, Xiao-Nong Zhou and I have just published the first Primer on Schistosomiasis in Nature Reviews Disease Primers. We hope readers of the article will agree that the Primer provides a global and authoritative overview of research on the disease, as well as of the challenges facing the research community as it strives towards elimination of this debilitating condition. In the Primer we have tried to provide a comprehensive overview of the epidemiology and transmission of the parasites, how the disease is diagnosed and managed and the current and future prevention strategies. As we continue to dive into the world of neglected tropical diseases, we find ourselves examining schistosomiasis, a parasitic disease whose impact reaches 200 million people globally and is second only to malaria as the most devastating parasite affecting humans. Infection with Schistosoma haematobium leads to urogenital schistosomiasis, which has been correlated with the occurrence of bladder cancer. However, mechanisms responsible for this association have not yet been clearly identified. In this short review, we provide an update, highlighting the most recent studies on schistosome-associated bladder cancer, including those that focus on identifying changes in host biology during S. haematobium infection, as well as studies for the identification of potentially pro-carcinogenic parasite molecules, and we offer a discussion on some possible mechanisms driving schistosomal bladder cancer. Simulation of population dynamics of Bulinus globosus: Effects of environmental temperature on production of Schistosoma . . . Temperature is an important factor that influences the biology and ecology of intermediate host (IH) snails and the schistosome parasites they transmit. Although temperature shifts due to climate change has been predicted to affect the life history traits of IH snails and parasite production, the mechanisms of how this may affect parasite abundance and disease risks are still not clear. Andrea L. Araujo Navas et al. Spatial modelling studies of schistosomiasis (SCH) are now commonplace. Covariate values are commonly extracted at survey locations, where infection does not always take place, resulting in an unknown positional exposure mismatch. The present research aims to: (i) describe the nature of the positional exposure mismatch in modelling SCH helminth infections; (ii) delineate exposure areas to correct for such positional mismatch; and (iii) validate exposure areas using human positive cases. We found that overall, albendazole does not affect the microbiome composition. However, there is an interaction between treatment and helminths as in subjects who received albendazole and remained infected there was a significant alteration in Bacteroidetes. This helminth-albendazole interaction needs to be studied further to fully grasp the complexity of the effect of deworming on the microbiome. On National Deworming Day, Principal Secretary, Health and Medical Education, Pawan Kotwal said around 52 lakh (5.2 million) children would be administered deworming tablets in the state (Kashmir). . . He said the children between the age group of 1 to 6 would be administered deworming tablets at anganwari centres, while those above six years of age would be covered at schools, orphanages and religious institutions in order to improve their overall health, nutritional status, access to education and quality of life. Under the initiative, the brainchild of the Planning Commission and the first of its kind to be introduced in the country, the Islamabad Capital Territory administration will reach out to the local minors, both school-age (5-15 years) and those aged under five, as well as women of reproductive age once a year to protect them from intestinal parasitic worms, which can lead to anaemia, malnutrition, impaired mental and physical development, besides threatening the children’s education and productivity. The Global Trachoma Mapping Project (GTMP) is the largest infectious disease survey ever undertaken. With 60 partners, 2.6 million people were examined across 29 countries for the blinding neglected tropical disease (NTD) trachoma, establishing the prevalence of the disease globally. Such an achievement was only made possible by building a diverse worldwide consortium. This article examines that public–private consortium and attempts to highlight key factors in the success of its development and operation. In June this year, the World Health Organization (WHO) announced that Ghana was the first country in sub-Saharan Africa to eliminate trachoma as a public health problem. This is a major achievement given that at the beginning of the century, it was estimated that 2.8 million people in the country were at risk of this devastating but preventable disease. At the ceremony on August 7, the official certificate of elimination was presented to Ghanaian Minister of Health Kwaku Agyeman-Manu by WHO representative Dr Owen Laws Kaluwa. The Treasury has paid the storage charges for drugs whose distribution to millions at risk of going blind had been delayed for 10 months. The Ministry of Health yesterday said the consignment of Zithromax, an antibiotic used to treat trachoma, had been in a warehouse since last October, when it was delivered by a US-based organization. The African Research Network for Neglected Tropical Diseases (ARNTD) with support from the U.S. Agency for International Development (USAID) and UK aid from the UK government, through the Coalition for Operational Research on Neglected Tropical Diseases (COR-NTD), is seeking proposals for both operational and social science research on ‘’Emerging Challenges facing NTD program implementation in Africa.’’ This second edition of the Small Grants Program (SGP II) is to support African researchers in both early and mid/late career to undertake operational research aligned with the goals established in the London Declaration on Neglected Tropical Diseases. 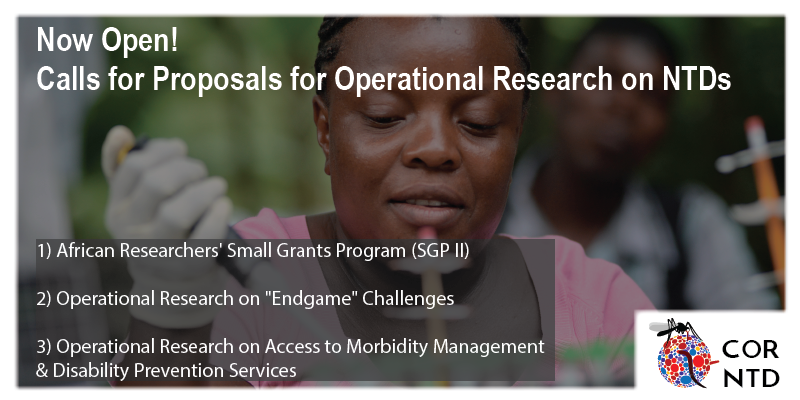 The Neglected Tropical Diseases Support Center (NTD-SC) at The Task Force for Global Health is soliciting proposals for operational and implementation research led by country programs that address country-identified endgame challenges. With this call, the NTD-SC (which serves as Secretariat of the Coalition for Operational Research on NTDs, or COR-NTD) seeks proposals for operational and implementation research nested in national programs targeting lymphatic filariasis, onchocerciasis, schistosomiasis, and trachoma. When people think of obstacles that impact children’s education, many consider the immediate challenges: cost of supplies, tuition, uniforms, overcrowded schools, and overburdened teachers, maybe even the physical distance between homes and schools in underserved areas. But these interferences pale in comparison to the barriers presented to sick children living in vulnerable populations. The END Fund in collaboration with Amani Global Works are working together in the Congolese island of Idjwi to implement a public-health program designed to control and eradicate neglected tropical disease (NTD). This report provides an overview of the 2017 key achievements in research and research capacity strengthening and knowledge management; ongoing work in 2018 and beyond in research support, research capacity strengthening and global engagement; and, TDR’s updated strategy for 2018 – 2023. Health based civic organizations have raised optimism on the new administration's capacity to address prevailing health issues and have pledged to help President-elect Cde Emmerson Mnangagwa ensure Zimbabwe's access to health. In an open letter to Cde Mnangagwa, the Community Working Group on health, which represents 40 organizations, said they are looking forward to an era where Zimbabweans will have universal health coverage. Adverse effects of antileishmanial drugs can affect patients’ quality of life and adherence to therapy for visceral leishmaniasis (VL) and post-kala-azar dermal leishmaniasis (PKDL). This study aimed to investigate the feasibility of using focused pharmacovigilance for VL (VLPV) in Bangladesh’s National Kala-azar Elimination Programme for the early detection and prevention of expected and unexpected adverse drug reactions (ADRs). Due to climate change, the geographical distribution of sand flies during the last decades has shifted northward from latitudes below 45°N in southern Europe to latitudes just above 50○N. Recent studies show that some phlebotomine sand flies were recorded in several parts of Germany and Belgium. In central Europe, some autochthone leishmaniasis cases are being recorded in regions traditionally regarded as leishmaniasis-free. Post Kala-azar Dermal Leishmaniasis (PKDL) is a sequela of Visceral Leishmaniasis (VL) and suggested as reservoirs of parasite. Currently, Miltefosine (MF), Amphotericin B Deoxycholate (ABD) and Liposomal Amphotericin B (LAmB) are recommended by World health organization (WHO) as treatment options for PKDL. But single MF or LAmB often causes incomplete cure specially cases with extensive lesion. To overcome this problem here we describe four cases of PKDL who had widespread nodular and macular lesions and were treated with two cycles of LAmB doses with 20 mg/kg body weight divided into 4 equal doses and administered every alternate day. The officer in charge of Tuberculosis and Leprosy Control Unit in Gombe State, Dr Mustapha Musa, has said that the state stand the risk of an increase in the number of undetected leprosy cases. Musa told journalists in Gombe yesterday that the alarm followed the non-replacement of some retiring technical field officers who were responsible for detection of cases. The fourth edition of the Gínjol Patents Fund (CERCA institute) will support ISGlobal with funding for a knowledge transfer project that seeks to identify new biomarkers of Chagas Disease through the analysis of extracellular vesicles. Of the 18 proposals submitted this year, eight were selected. “The fact that a global health project receives this type of support is a very positive signal, and could help improve the health of millions of people worldwide,” says Marina Espriu, Business Development Manager at ISGlobal, an institution supported by “la Caixa” Foundation. “This shows that it is possible to obtain funding for innovation in areas with little profit but high social impact,” she adds. There have been several encouraging developments in the fight against podoconiosis in recent years. . . Despite this progress in generating evidence, translation into policy and practice at the global level is poor. Four clear barriers exist. WHO received confirmation of a human case of dracunculiasis (guinea-worm disease) in Angola – a country not known to have had any cases in the past. The case was detected through a nationwide guinea-worm case search during the national immunization campaign against measles and rubella. The specimen was sent to the WHO Collaborating Center for Dracunculiasis Eradication at the United States Centres for Disease Control and Prevention, where a polymerase chain reaction (PCR) test confirmed the worm as Dracunculus medinensis. A bed net designed to kill insecticide-resistant mosquitoes could prevent millions of cases of malaria across sub-Saharan Africa, scientists have found. A two-year clinical trial in Burkina Faso showed that dousing bed nets with a combination of chemicals resulted in a 12% reduction in clinical malaria cases, compared with conventional bed nets. The findings, published this week in the Lancet, demonstrate a “big step forward” in the fight against malaria in Africa, which is home to 91% of all malarial deaths worldwide, said Professor Steve Lindsay of the department of biosciences at Durham University, who worked on the study. A novel laboratory-synthesized molecule, based on natural compounds known as marinoquinolines found in marine gliding bacteria, is a strong candidate for the development of a new antimalarial drug. In tests, the molecule proved capable of killing even the strain that resists conventional antimalarials. The molecule displays low toxicity and high selectivity, acting only on the parasite and not on other cells of the host organism. The first new treatment in 60 years for a particularly stubborn kind of malaria is raising hopes that it might help eradicate the disease, even though the treatment can cause a dangerous side effect. With its single dose, patients prescribed tafenoquine are more likely than those on primaquine to complete the treatment, preventing more relapses and problems with drug resistance. But tafenoquine’s biggest selling point, its long-lasting single dose, is also a weakness. Both primaquine and tafenoquine can cause a dangerous side effect in people with glucose-6-phosphate dehydrogenase, or G6PD, deficiency, an abnormality on the X chromosome that affects 400 million people worldwide. Increased use of long-lasting insecticidal nets (LLINs) over the last decade has considerably improved the control of malaria in sub-Saharan Africa. However, there is still a paucity of data on the influence of LLIN use and other factors on mosquito bionomics in different epidemiological foci. The objective of this study was to provide updated data on the evolution of vector bionomics and malaria transmission patterns in the equatorial forest region of Cameroon over the period 2000–2017, during which LLIN coverage has increased substantially. Mosquitoes are the world's deadliest animals, transmitting diseases that kill hundreds of thousands of people annually. Only the females bite, to acquire protein to make their eggs. But blood can also serve as a refreshing beverage on a hot, dry day. A new study finds that dehydrated mosquitoes are more aggressive, land more often on hosts and feed more frequently than those with ready access to water. In quenching their thirst, they may also increase the spread of disease, says Joshua Benoit, a biologist at the University of Cincinnati and senior author of the study, published in May in Scientific Reports. Five Nigerian teenagers won first place in the junior division of the Technovation World Pitch Summit held in San Jose, California last with an app that has the potential to save thousands of lives. . . The girls’ app addresses a real life and death issue in Nigeria. The regulator, National Agency for Food and Drug Administration and Control (NAFDAC), has struggled for years to close in on a rampant fake drug market. Though the exact number of counterfeit drugs is contested, many malaria deaths in Nigeria are have been linked to the use fake medicines. African countries are the dumping ground for 40% of the world’s recorded counterfeit drugs. Registration for the 2018 Public Health Informatics Conference is now open! Don’t miss this opportunity to connect with colleagues and address the science of public health informatics, evolving public health systems, and public health’s role in our nation’s expanding health information technology infrastructure. Since 1998, the Centers for Disease Control and Prevention (CDC) has hosted the International Conference on Emerging Infectious Diseases (ICEID). Held every 2-3 years, the conference brings together more than 1500 public health professionals from around the world to encourage the exchange of the latest information on issues affecting the emergence, spread, and control of infectious diseases. With scientific input from more than 30 national and global partners, ICEID 2018 will mark the 10th occurrence of this premier infectious disease conference..
Theme: Uniting all to overcome and fight against NTD's & infectious diseases for improved health protection. The 2018 FIP congress in Glasgow, Scotland, invites pharmacy practitioners and pharmaceutical scientists from around the world to come together to consider ways of extending the role of pharmacists so that they play a full part in ensuring patients, and health systems, achieve full benefit from the medicines people take. Our first international workshop will be held in Bangladesh on the 2 – 6 September 2018. We aim to bring together researchers who have an interest in blackflies, sandflies and biting midges for networking and sharing of expertise.The first day of our week-long workshop will consist of a conference day of talks, consisting of lectures from experts on vector ecology and epidemiology. We will also hold a short workshop on this day to discuss the current issues affecting vector research. Following this, we are holding a four-day training course for early-career researchers, to teach practical laboratory and field skills for research on sandflies, blackflies and biting midges. The London School of Hygiene and Tropical Medicine is offering an online course bringing together all aspects of elimination and control together, this course provides a unique platform to learn about the tools needed for an effective VL control programme. The course contains examples from experts delivering current control and elimination programmes in South Asia and East Africa. The course provides learners unprecedented access to practical tools and insight into understanding the requirements and complexities of such programmes. The International Paediatric Ophthalmology and Strabismus Council and The Department of Pediatric Ophthalmology at The Red Cross War Memorial Children’s Hospital, Cape Town are proud to announce the 2018 ROP Africa Symposium. The 2018 International Agency for the Prevention of Blindness (IAPB) Council of Members will be held in Hyderabad and our local host will be L.V. Prasad Eye Institute who are celebrating the 20th anniversary of ICARE (International Centre for Advancement of Rural Eye Care). We are expecting 400 delegates between the 15-16 September to celebrate the progress that has been made in India and across the South East Asia Region as well as looking ahead at the challenges that eye health faces not just in the region but across the globe. The theme of [The Royal Society for Tropical Medicine and Hygiene, or] RSTMH’s 2018 two-day Annual Meeting is intersections of neglected tropical diseases (NTDs) with non-communicable diseases (NCDs) and the Sustainable Development Goals. We will bring together voices from different sectors, locations and disease areas to showcase the lesser-known problems caused by intersections, and their impact. The theme for this is ‘Research to Implementation: A Call for Global Action’. With this invitation to register, we are also calling for abstracts from all those involved in podoconiosis research and implementation. In order to stimulate high levels of participation, the conference programme will include two sessions of research presentations, one of implementation presentations, and a poster display area. Abstracts for each of these will be selected by competitive process, and prizes will be awarded for the best research and the best implementation presentations. Travel awards will be available for a limited number of selected abstracts. The Universal Health Forum will celebrate the drive towards Universal Health Access in Africa. There will be high-level forums on maternal health, child health and malaria, NTDs and NCDs. There will also be an exhibition hall showcasing new technology, diagnostics, and treatments, and a dinner and awards ceremony celebrating leaders from across Africa. We are delighted to announce the dates for the 9th NNN annual conference, subject to venue availability. Theme: Advancing in science and improving care to prevent infectious diseases. Hosted by the international Society of Travel Medicine. We would like to invite health/science journalists from Cameroon, Democratic Republic of Congo, Ethiopia, Ghana, Kenya, South Africa, South Sudan, Sudan, Tanzania, Uganda, and Zimbabwe to submit their applications for a media workshop to be held on 1st – 4th October 2018 in Kampala, Uganda. All interested journalists may apply using the online application form no later than August 17, 2018. Theme: Advancing health systems for all in the SDG area. World Sight Day (WSD) is an annual day of awareness held on the second Thursday of October, to focus global attention on blindness and vision impairment. This year, the "Call to Action" for World Sight Day is "Eye Care Everywhere." Central topics for this year's meeting will include pandemic preparedness, sustainable development goals, and access to essential medicines. The conference includes prompt presentations, special sessions, workshops, symposium, oral talks, poster presentations and exhibitions. We expect your kind presence at the conference which will discuss the recent emerging diseases, outbreaks, categories, epidemiology, diagnosis, therapeutics etc. The Collaborations Addressing Vulnerable Populations (CAVP) Forum is a platform dedicated to the steps being made across the biomedical landscape to provide healthcare solutions to populations that represent an unmet medical need. The CAVP Forum will provide attendees with the opportunity to attend sessions from five unique tracks. We will highlight how drug repurposing can alleviate development costs, discuss different ways to ensure access to safe and cost-affective drugs, examine regulatory pathways and incentives targeting rare and neglected tropical diseases, and explore public–private partnerships that support the development of new treatments for vulnerable populations. The objectives of this workshop are to review the cystic echinococcosis situation in Latine American and Peru, to review state-of-the0art methodologies, and to evaluate the evidence generated by pilot projects. The workshop is being coordinated by the University of Surrey (UK) and the Universidad Nacional Mayor de San Marcos (Peru), and will have contributions from other leading researchers. We are now inviting Early Career Researchers (ECR) from the UK or Peru to apply to attend this workshop. All travel and accommodation expenses will be covered by the Research Links programme. Applications are welcome until 1 August. Successful candidates will be contacted in early August. ASTMH and the Institute for Disease Modeling (IDM) are partnering to offer an introductory course on using agent-based models for modeling infectious diseases. Modeling is an essential component for understanding disease dynamics and creating effective control strategies, yet it remains inaccessible to many researchers in public health. This 1.5-day course offers an overview of Tropical Dermatology, an essential component of tropical medicine. The course is designed for clinicians who are already familiar with clinical tropical medicine, either from working in tropical environments or from seeing patients returning from the tropics. Saturday’s session is devoted to cutaneous leishmaniais (the latest in the rapidly changing epidemiology, diagnosis and management). Skin conditions will be reviewed from the standpoint of diagnosing and treating individual patients – and from managing skin diseases on a population basis. PLOS Pathogens and PLOS Neglected Tropical Diseases, along with the American Journal of Tropical Medicine and Hygiene and Vector Borne and Zoonotic Diseases, present a Writing Workshop intended to equip and support early career researchers and researchers from disease endemic regions in understanding the publication process and best practices for manuscript writing. Highlights of the sessions include: framing your research and choosing your journal, mapping out your paper, abstract writing, the mechanics of writing, and research and publication ethics. For more information, please contact Charlotte Bhaskar at cbhaskar@plos.org. This practical, hands-on workshop will introduce participants to publicly available sequence analysis tools. Using parasite genome and/or RNAseq data obtained from actual field or laboratory experiments, participants will learn analytical methods and workflows used to extract meaningful biological, evolutionary and/or epidemiological insights. Through live exercises led by experts in the field, participants will learn how to retrieve data from sequence repositories, run them through preconfigured or customized workflows, and visualize and explore the data using web-based tools. This course will explore the changing worldwide landscape and global health risks with the exponential increase in urban population growth. Beyond vector-borne diseases, the lack of barriers between animals, vectors, the environment and water supply increases the risk of other diseases such as leptospirosis, Ebola and plague. We urgently need to be prepared for new microbial transmission pathways in the urban environment that affect human health. We are pleased to announce the date for the 7th Global Scabies Control meeting. The meeting will be held on Sunday 28th October in New Orleans, LA, USA. Please mark this in your diaries now! Further information and registration details will follow in coming months. This conference intends to gather researchers working in areas related to Leishmaniasis, from treatment to prevention. In fact, as leishmaniasis is slowly but constantly, increasing worldwide, this conference is addressed to show the latest research trends in this area. The idea is to push forward the battle against this persistent disease. Celebrating women in global health leadership and cultivating the next generation of women leaders. Theme: "Creating the Healthiest Nation: Health Equity Now." This meeting will be the fourth we have held on this topic, with previous meetings in 2012, 2014 and 2016, and like before we will bring together members of the major UK research groups who have an interest in vectors or vector-borne diseases which could be a threat to the UK; groups with wider but related areas of interest; members of key UK Government Departments and their Agencies; and representatives of European organisations with an interest in this topic.